Who wouldn’t want to see more butterflies in their garden? (I’ll ignore the gentleman at the back, raising his hand). Well, they’re really quite easy to attract. For example, you could plant cabbages: you’ll get flurries of cabbage whites. Not what you had in mind? Then simply plant nectar rich flowers. (In the above photos, six different butterflies are feeding on Verbena bonariensis – a great food source). And if you have the space leave an area of garden wild: both small tortoiseshell and peacock caterpillars feed on nettles. To join, click on this link – Butterfly Conservation Website – and enter the code GARDEN1550. Oh, almost forgot – you get a free car sticker too. I like the very close-up pic at the top of the page. Lovely photos. I struggle to attract buutterflies I’m afraid,despite growing Verbena. The ones I have seen seem to like Elysium best. Hi Annette, did you get my email about a week ago? You won the prize draw for Great Garden Design book! I thought you might be on holiday? Dave p.s. Sorry to hear VB doesn’t attract loads of butterflies for you. Maybe because it’s just a little colder where you are? Wow. Sorry yes I have been away. Will look now. 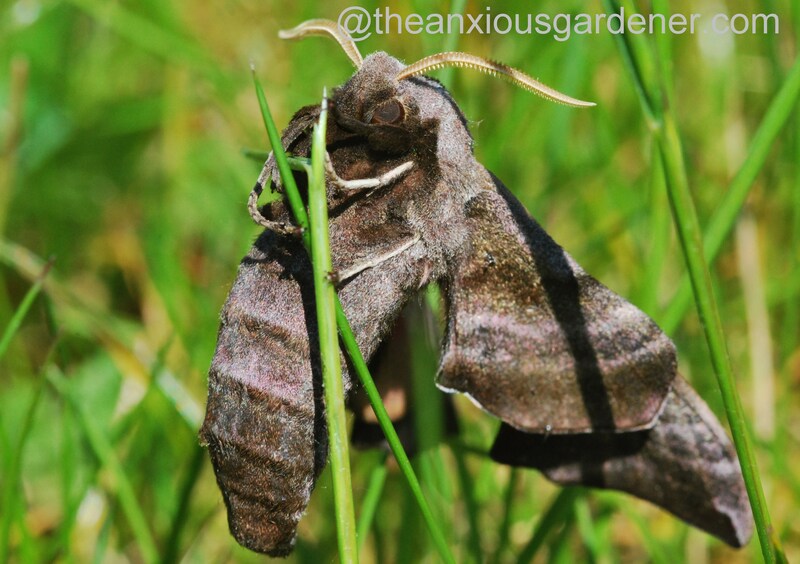 How do you tell the difference between a moth (yes, they fly around during the day and bring you aphids) and a Butterfly? I would like to not encourage the moths. There are certain moths I’m sure you’d like to encourage, Sheri. Like the humming-bird hawk-moth above. They are beautiful and fascinating to watch. And there are many day flying moths that are large and beautifully coloured. Both moths and butterflies are part of the family lepidoptera and so there isn’t actually much difference between them. There are some anatomical differences such as the antennae and how they hold their wings but butterflies are only diurnal. Dave p.s. What’s that about bringing aphids? There’s a very small cream colored moth insect that flies around during the day that all the gardeners swear is a bringer of aphid. It looks like the female winged Soybean aphid.They tend to lay on sweet fruit trees (apple, cherry and plum), cabbage, broccoli & Pak Choy. In my backyard food garden I keep a “dipping bucket” going all spring and summer. It has mild dish detergent & Tee Tree oil in it. When I find an area of infestation I just gently wash the branch & removed damaged leaves or if it’s a low garden plant just prune the aphid cluster and submerge into the bucket. My fruit trees are almost 5 years old now so I’m a bit protective of them especially when it come to apple maggot. I grow some herbs in my front yard but the rest of the plants are perennial Iris, hydrangea, rose and so on and I never treat anything in the front yard. So Mother Nature can have at it out there. I have to agree with you Dave. I did some more reading and the photos all remind me of flies. I’m wondering if my compost bins are helping them. Dave, do you know ‘Rothschild’s Reserves: Time and Fragile Nature’, by Miriam Rothschild? I’d be happy to send you my copy. Beautiful butterfly photos, David. Since I let my fields go wild, I have seen quite an uptick in the number of species that visit. Every year my land gets wilder and wilder! Can you imagine the impact if everyone set a portion aside for wildlife? It would be wonderful! And while you’re at it join the Bumblebee Conservation Trust too!!! You’ll need to write a post about them!? I’m sure they could do with the publicity. I joined a couple of years ago. To be honest the full price membership isn’t expensive so I’d encourage anyone thinking of joining not to scrimp; paying the full membership fee means that Butterflies are only going to benefit more! Seriously impressed by your pics. And no, it wasn’t me with my hand up. Looked like a flash of blue panama.